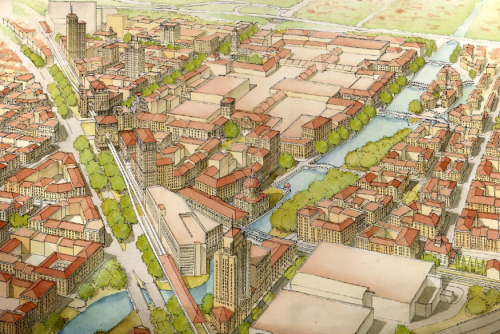 In our fifth installment of case studies related to our program’s field of research and practice, we cover one of the hottest topics in urbanism today: retrofitting sprawl. The terminology varies, with “retrofitting suburbia” and “repairing sprawl” among the most popular labels, as urban planner Emily Talen explains in an interview conducted by our faculty member Julia Koschinsky last year. In our program we define it within the boundaries of regenerating intermediate landscapes, sprawl being just one type of intermediate landscape. No matter what the terminology, the underlying objectives are the same: to develop walkability on under-performing sites (such as dying malls, etc. ), to convert large commercial strips into boulevards, to integrate public transit systems and to restore local ecology. Due to the nature of sprawl and its earlier prevalence in places like the U.S., most case studies in sprawl repair are be found there. 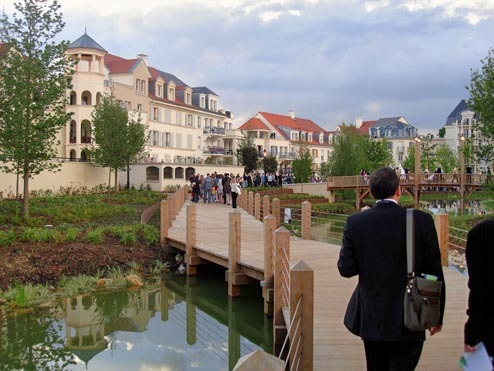 Over the years, however, sprawl has also reached the growing urban centers of Europe, and so we’ve also included a few examples of European suburban regeneration in this case study roundup. Enjoy! 1. Mashpee Commons, Massachussetts, USA. 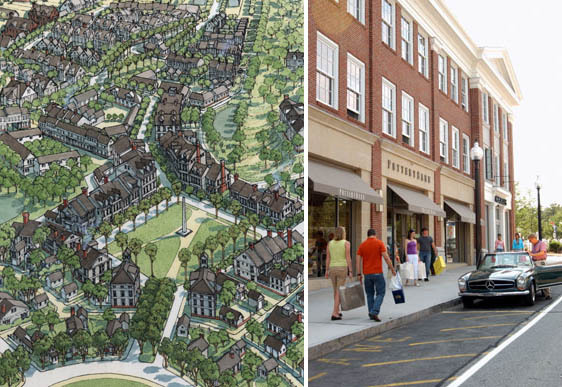 [Duany, Plater-Zyberk & Company] – Known as the first shopping center retrofit to mix uses and alter street patterns, Mashpee Commons in Massachusetts replaced a 140-acre 1960s-era family-owned shopping center, surrounded by parking, with several blocks of one- and two-story buildings on tree-lined streets. Re-design began in 1988 and finalizaed by 2002. 2. 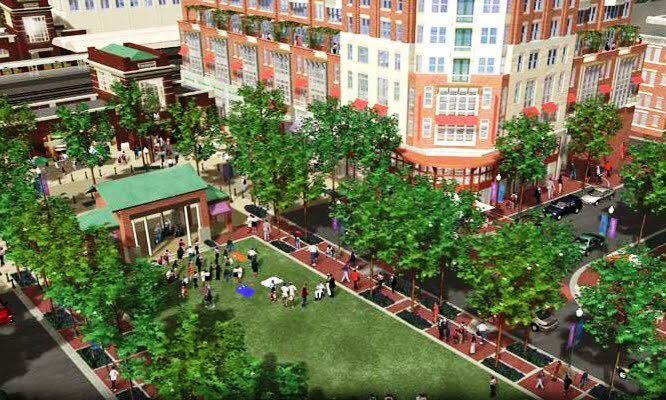 BelMar, Lakewood, Colorado, USA – What was once a mall on a 100 acre super-lot was transformed into 22 walkable blocks with public streets, bus lines, and varied housing types that includes 1,500 households set within a new urban and multi-functional atmosphere. The old parking lot was replaced with mixed-use buildings, residential buildings with shopfronts, and a central square. 4. Surrey Central City, Vancouver, British Columbia. [Bing Thom Architects] – Located forty minutes outside Vancouver, Surrey Central City replaced a dying mall with a new high-tech university. With almost half a million residents, it is linked to the city by an elevated mass transit system. The tight grouping of the new buildings and the visibility of the iconic structure celebrate urban density and synergy between integrated uses. More here. 5. Downtown Kendall, Miami, Florida, USA. 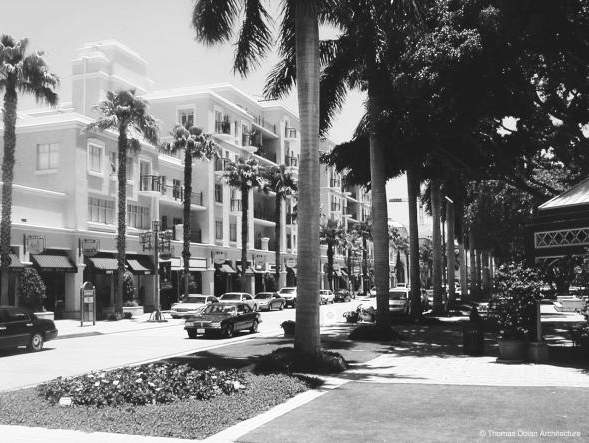 [Dover, Kohl & Partners Town Planning and Duany, Plater-Zyberk & Company] – The area surrounding the 1962 Dadeland Mall in Miami constitutes an emerging edge city, the goal of its retrofit to transform it into a mixed-use, transit- oriented downtown for suburban Kendall’s 400,000 residents. 6. 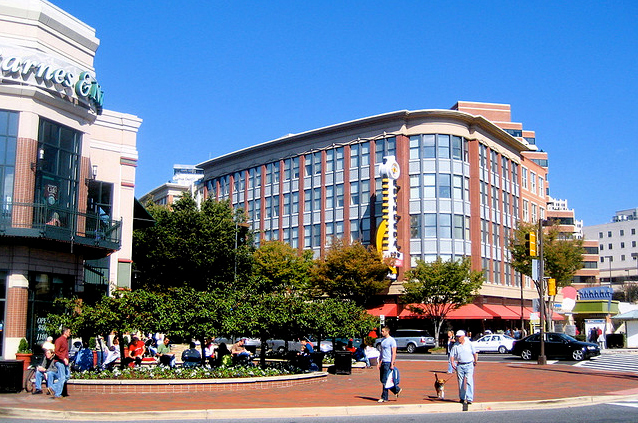 Bethseda Row, Maryland, USA – According to NRDC writer Kaid Benfield, the Maryland community just outside Washington D.C. has grown into one of the best suburban retrofits in the US. 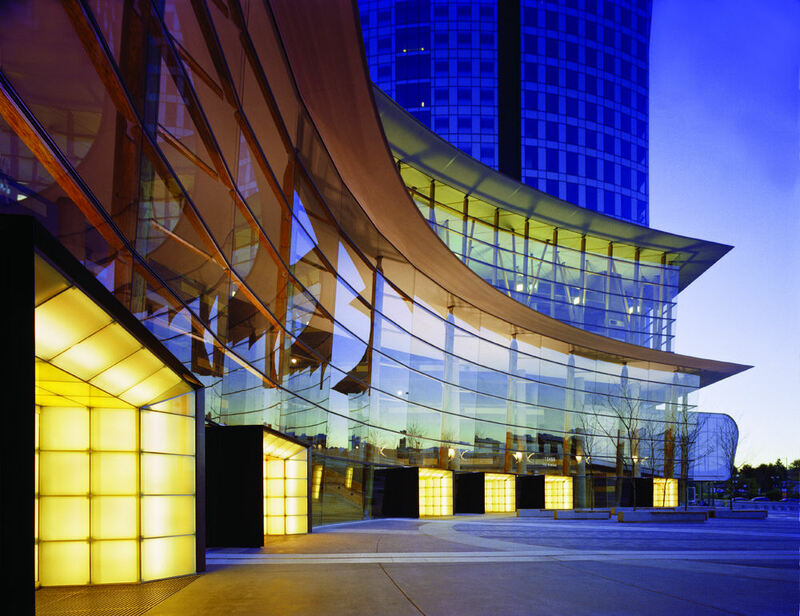 The upgrade began in the mid-1990s and revitalized a suburban commercial district into a mixed-use, walkable downtown, described by many as feeling more like a community that has evolved over time than an individual project. It has garnered awards from the federal EPA, the Urban Land Institute, and the National Association of Home Builders. 7. Twinbrook Commons, Rockville, Maryland, USA – Previously host to various parking lots and industrial uses, this brownfield site has been re-designed to connect existing neighborhoods with a pedestrian-friendly transit-oriented environment through a clear hierarchy of streets and mixed-use spaces. High-rise residential buildings surround a central plaza and small four-story residential buildings form a transition zone between the transit plaza and the surrounding neighborhoods. 8. Plessis-Robinson, Paris, France – Named “the best urban neighborhood built in the last 25 years” by the European Architecture Foundation, the re-design of this suburb of Paris started in 1990 and was completed 10 years later, integrating public buildings, retail, 120 acres of protected green space, subsidized affordable housing, public transit systems and traditional French architectural forms. 9. Nord-Jaeren, Norway – At a regional level, the current planning scheme for Nord-Jaeren in the Rogaland County of Norway is an attempt to prevent and contain the effects of sprawl, through a series of measures that include efficient and internconnected public transportation networks and green transport corridors, reduced land-use per person, and preserving cultural heritage and ecosystems. 10. Aberdeen, Scotland – Another series of measures, rather than an individual project, Aberdeen City’s recent review of its Green Belt policy similarly reveals initiatives that in effect, act as a inhibitors of sprawl, such as protecting landscape setting, reducing the need to travel, avoid sporadic or isolated development, protecting and enhancing habitats and recreational resources and siting and design guidance to ensure quality and sustainable development. And special thanks to our collaborator Marco Adelfio for his project suggestions! Hi, Sorry for the delay in our answer. No, we are not using BlogEngine. This is a wordpress template, with a few hours of editing.